Bangkok was our first stop on our South East Asia whirlwind adventure! OK, OK Bangkok wasn’t that bad, but it is like no city we’ve ever been to. It’s busy, hectic and really smoggy. By day three we were craving some of that fresh London air! And as tourists you get hassled… a lot. It’s a real shame we don’t look more thai… There was a lot we did like about Bangkok however. And I would definitely say we appreciated it more the second time we visited, after we spent 2.5 months backpacking. What we did like about Bangkok was that it was cheap, especially taxi rides when you can get it on the meter (always worth haggling for meter). Also the street food, some of the best food we had on our whole South East Asia trip was in Bangkok, Thailand. And because of the amount of street food stalls it was the cheapest too. The same dishes are done differently every where in Thailand so make sure you try dishes more than once. Soi 9 is the place to go for street food and in our 10 things to do in Bangkok blog post. The modern conviences. On our first stop to Bangkok we didn’t really appreciated how modernised Bangkok was and how accessible home comforts can be. When you first start travelling you hate seeing McDonalds, or 7 or 11s on every street corner, but after two months of haggling in tiny shops its so refreshing to go into these shops, buy something for the price stated and know you’re not getting ripped off. The people as well seem more…. well, modernised, I guess. As a gay traveler you do feel more comfortable in Bangkok as you see far more gay people and trans people, or people just breaking the gender stereotypes here with dress and style, which is also refreshing to see. Saying that we were also pleasantly surprised by this positive attitude in both Cambodia’s Siem Reap and Vietnam’s Hanoi too. Some of the bad side of Bangkok is the scams. We almost fell into the Great Grand Palace Scam which every travel guide warns you about. And one time we also paid a tuk tuk driver 50 baht to cross a roundabout. We thought we were further from Khoa San Road (the travelers’ hub) than we were. 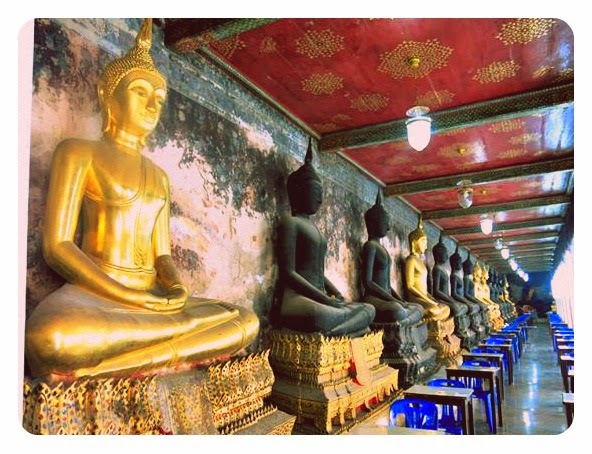 All in all Bangkok is a city like no other, so go visit, eat, but don’t stay too long.